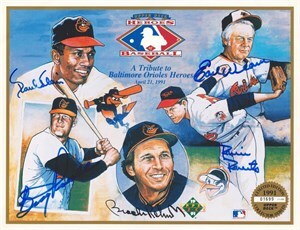 A Tribute to Baltimore Orioles Heroes 8 1/2 by 11 inch commemorative card sheet distributed by Upper Deck exclusively at the April 21, 1991 Orioles home game, autographed in thin blue marker by Paul Blair (deceased), Boog Powell and Hall of Famers Robin Roberts (deceased), Brooks Robinson and Earl Weaver (deceased). 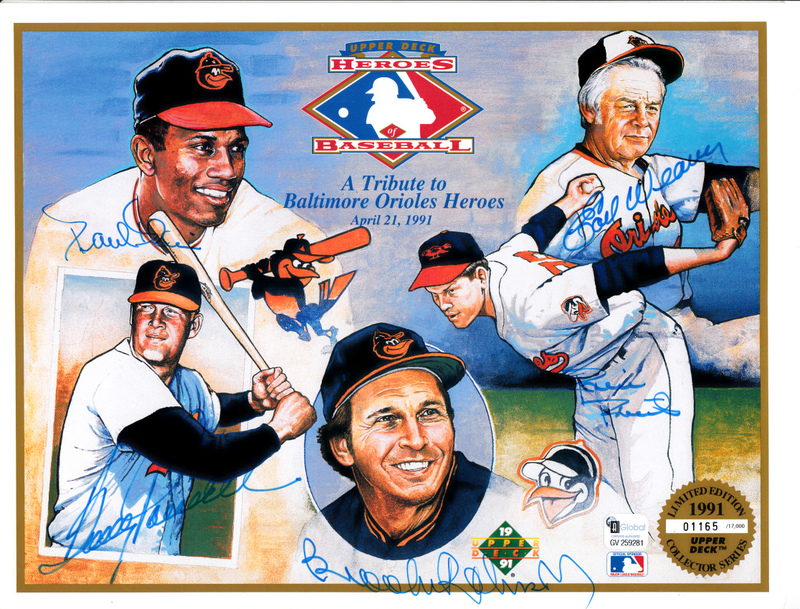 (Blair, Powell and Robinson formed the core of the Orioles 1969-1974 dynasty that Weaver managed to five AL East titles in six years, including three AL pennants and one World Series title.) Completely signed sheets are extremely rare. HAS THUMBNAIL SIZE SURFACE CREASE ON THE BACK TOP LEFT CORNER. Witnessed and authenticated by Global, with their matching numbered sticker and certificate of authenticity. ONLY ONE LEFT.